Apologize for adding a new post to the previous, but I hope a focus on the findings and research – rather than flaming – will contribute positively to the discussion on this forum. It appears that minor structural variants on Ramatroban result in an entire blockage of PGD2. This is “insurmountable” according to the authors. The most “insurmountable” compound is TM-30089. It functionally shuts down PGD2. Moreover, this compound is highly selective (thus not affecting other pathways) and is entirely soluble in water. unluckily i am leaving for the weekend in an hour, so I don’t have much time to look into this, but damn this sure sounds exciting! » time to look into this, but damn this sure sounds exciting! » to the discussion on this forum. » pathways) and is entirely soluble in water. PGD2 is not the only postaglandin that is taking our hair. Cotseralis says that at least one other postaglandin also causes hair loss and that other one is way more powerful at taking our hair than PGD2 is. That’s why we need to block the applicable receptor rather than blocking just PGD2. If we block the receptor instead then we block all of the postaglandins that are taking our hair. THANK YOU. We are indebted to you for finding this. Excellent research!!! » are taking our hair. I disagree with you on this, jarjar, because different prostaglandins will have DIFFERENT RECEPTORS. If they all had one generic receptor, every time ANY of the prostaglandins bound to it, it they would activate it and messages would be completely scrambled. TM30089 works in the same way as Ramatroban and OC000459 by blocking the CRTH2 (DP2) receptor. According to the study in may have longer lasting effects than Ramatroban and is more selective to target the right receptor. 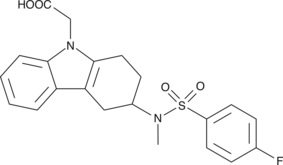 The other “bad” PGs are derivatives of PGD2, in other words they come from further degredation of PGD2. Cots refers to 15-dPGJ2 as one such derivative which completely halts hair growth. Google 15-dPGJ2 and you will find many papers which show 15-dPGJ2 leading to cell death. » » need to block the applicable receptor rather than blocking just PGD2. » » are taking our hair. I understood at the time I made my previous post that there could be more than one receptor the hair-stealing postaglandins bind to, but rather than getting into all the specifics of that in my previous post I intentionally didn’t mention that point. You see, the original poster’s idea is that we simply need to just negate PGD2 and I only wanted to disprove that one point rather than go into a larger point that there could be more than one receptor where these hair-stealing postaglandins bind. I actually thought of exactly what you are pointing out and decided it was not relevant to the smaller point that I was trying to make which was that we need to deal with the receptor rather than just PGD2. I’m aware that these hair-stealing postaglandins could bind to other receptors but I’m hoping that either that will turn out not to be the case or that even if they can bind to other receptors it won’t have the same hair-stealing effect as when they bind to GPR44. Perhaps these nasty postaglandins that steal our hair don’t have that same effect when they bind to a different receptor. At least that’s what I’m hoping. Anyway, like I said the issue of these postaglandins binding to other receptors besides GPR44 did cross my mind; I just didn’t think it was necessary to put it into my previous post in which I was only trying to assert that we need to cancel out more than just one postaglandin (PGD2) and so we need to focus on the receptor instead of PGD2 specifically. Actually I stand to be corrected, i cant recall if the Cots study only included testing PGD2 and its derivative. According to this study PGD2 and its derivatives may not be the only enemy. PGH1, PGH2 and PGD1 might also exhibit the same effect on the CRTH2 receptor as PGD2. » its derivatives may not be the only enemy. This is likely why drug companies are focusing on CRTH2 inhibitors rather than PGD2 inhibitors. For example Oxagen and Actelion. Haven’t been here in awhile, wearied completely of highjacked threads and have to ditto what TonyUK posted re iron filings for brains. It’s refreshing to see some the knowledgeable folks here engaging in very interesting back and forth on the latest developements. That said, are some of you thinking tm30089 may work as a stand alone treatment? Surely the company that makes it knows as much as we do and if it worked in that way why would they even need ‘Cots’? Apologies if I’ve overlooked previous answer to this rather simple-simon question. unluckily as I have pointed out in the other thread it appears that TM30089 is by no means cheap at all. It is far more expensive than OC000459 since 150usd is the price for 10 MILLIgrams, whereas OC is expected to sell at 300usd/gram. Nevertheless this is great news as the compound seems to be exactly what we habe been looking for. It is simply not affordable at this time. » » this. Excellent research!!! » interesting back and forth on the latest developements. » overlooked previous answer to this rather simple-simon question. The reason they need Cots is because he owns the patent to use it as a hair loss remedy. They cannot sell it as a hair loss treatment unless they license it from him. Remember, him and Garza developed the IP that led to the treatment. So presumably, they would partner with Cots and Garza. One thing to keep in mind when scouting potential treatments is safety. Don’t look for the most effective CRTH2 antagonist, but rather look for one that’s proven to be safe. Keep in mind, like finasteride, this has to be taken permanently. Sorry I haven’t been following this, but what is the dose or amount required for effective treatment? » required for effective treatment? No one has tested yet. Very interesting, so is anyone here on this yet? Or is going to be on this soon? If they could post some pictures to see results. Also if anyone has bought it. Whats the price? someone should buy it seriously there is a very good chance that not only will it stop baldness, but it will also regrow a lot(if not) hair back! I can’t see it getting tested by any amateurs at that price. For all we know it might easily take $100+ per day to get anywhere with it. That would be $3000 a month right there, and we would still have no idea if that was too much or not enough. And you might not learn anything worthwhile from staying on it any less than 3-6 months.